Sales are key to most businesses and whether you’re an employer or a salesperson, you need the right tools to succeed. The Sale Leads Tracker is the best way to keep track of both your sales and the strategies that work best with each one. Regardless of your business’s product or service, this free template can be formatted quickly to suit your exact needs. 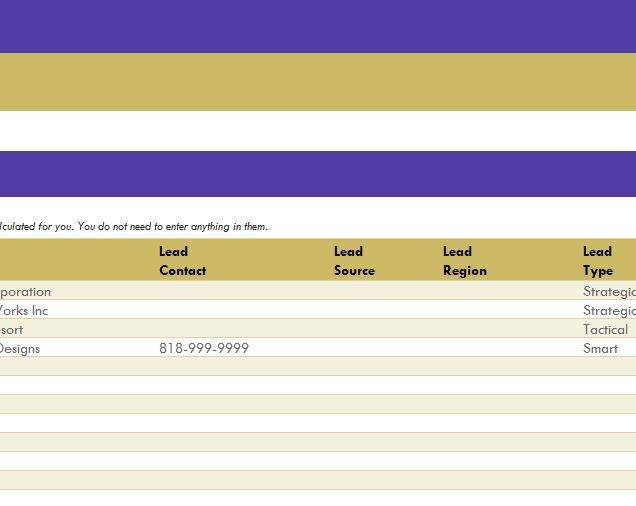 The Leads Tracker will also give you a forecast for the sales you enter into it. With accurate projects and a neat vehicle to organize all your contact information for each lead, there’s no way you can’t succeed. To learn more about this free template, continue reading the guide below. Once you have successfully downloaded the free Leads Tracker by clicking the link at the bottom of the page, you can start customizing the document. Begin by entering information into the “Lead Data” tab. This tab simply requires you to enter the name of your lead, contact information, the type of strategy you will need to land the client, and potential income from that client as well based on previous experiences with their business. You will also list helpful items like the estimated percent chance of landing the sale, the estimated closing month, and a weighted estimation of the income you would receive. Now, click on the “Forecasted Sales” tab. You can view all of the information you have entered in the previous tab here, but in a much more convenient overview. The Leads Tracker lists out all the months of the year and when your leads will likely show results from the information you have already entered. Scrolling down to the bottom of the page, you can also see a helpful graph, showing the profit over time. The pink line of the graph will show cumulative income and the yellow will display monthly gross. You can use this information to make better decisions for your sales and organize your leads to planning effective strategies as well.